I have no idea why this topic came to mind but it’s interesting to me. 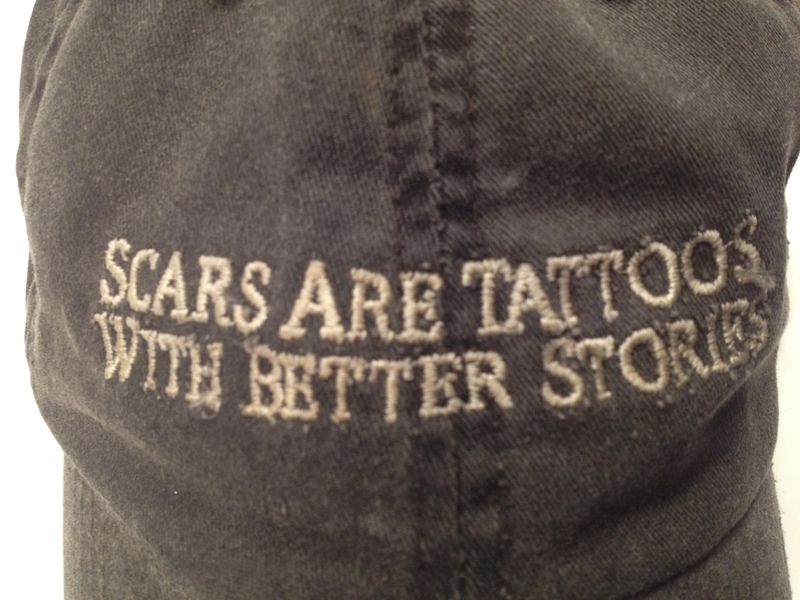 One of my best friends has a hat that says “Tattoos are Scars With Better Stories” on it. Somehow I caught myself looking at my latest scar and was thinking about how I got it. Then I realized I had about one real scar for each decade I’ve been on the planet. The first scar is on my knee. I’m pretty sure that this one is actually several scars on top of each other over the course of several years. Those years all happened during my first decade. My parents have a sloped driveway that goes down from the street. As kids, we would go down them on just about anything with wheels on it. I distinctly remember riding down on a Big Wheel while on my knees. One slipped and, well, I have a scar on it now. Of course I also probably fell off a skateboard and landed on the knee too. And I’m sure that there was a bike crash too. I’ve got lots of good memories of goofing off with my brother and friends on that driveway. Next up is a scar on my upper lip. That happened while playing baseball with a youth group in my teens. I was playing first base and caught a ball then went to put out the runner at first. The next bit is a little hazy. I was really sure that I’d gotten him and that we kept on playing the game. It gradually dawned on me though that I was on the bench and my team was in the field. Apparently I dove heroically (or maybe tripped) and my head got the runner rather than the glove. My face applied the tag on his knee and I don’t think that was a legal put out. The result was a couple stitches to the right side of my upper lip and a concussion. In my adult years, my wife thought I was always mad at traffic and the world when I was driving. It turns out that from that angle my scar looks like a sneer. If you’re ever in the car while I’m driving, please don’t take this personally! My twenties brought a few scars to one knee. I was playing basketball at my wife’s company picnic and blew out my knee while going one on one with her boss. By “blew out” I mean torn ACL, sprained MCL, cartilage damage. The works. It hurt so bad that I didn’t even notice how badly I’d skinned up my other knee which was close to the Big Wheel incident. At that point I realized that most of my major injuries to date had to do with basketball. Sprained ankles, a broken finger, and a chipped tooth were all included. I’ll shoot baskets with my kids but I’m not playing pick up games. The big scar of my thirties was by far the scariest. I’d taken a day off work and gone mountain biking with some friends – including the guy with the hat. We went to a trail that is a couple hours away and is for the most part an hour climb to an overlook followed by a bombing run back to the start. I’ve taken it really fast before but was fairly chilled out this day. Still I managed to hit a couple of rocks really wrong and was down on the ground in an instant. In a really rocky spot. On my face again. This time it was 16 stitches to the face. I went to a sales meeting a couple days later looking like I’d lost a fight with a wood chipper. Really the only good news was that I didn’t puke in my buddy’s car or even bleed on it. My life lesson here is not to text your wife from a hospital in a small town to tell her you’re going to be late for dinner because you’re getting your face sewn up. Words to live by. The newest scar was another biking related injury. It was fairly dumb and much less of a big deal. Fortunately. This one happened a couple months ago on a camping trip with friends. We were riding around a mountain lake and I decided to glance at the view which was really nice. I glanced a bit too long and ended up jousting with a downed tree. It really should have knocked me off my bike but was a glancing blow. Still, it gave me a good cut on my forearm. It’s right next to a similar one I got riding in Colorado. Both of these are just stories to tell. The cool thing about my scars is that they were all earned having a fun. There’s no tattooed phone number or name I will ever regret. Even as they age, my scars remain a part of me and who I am. If getting scars in my 40’s to match the ones I got as a kid means I’m staying young then I’m fine collecting more. I just need to remember to lead with my arm instead of my face. What about you? Do you have any good scar stories? Eric, as you know, my son has a very long scar on his arm which resulted from a fall from a bunkbed when he was 6. At the time, as much as I hated to see his perfect, precious little arm marred with this horrible scar (and believe me when I tell you the first year of that scar prior to his first plastic surgery revision was horrific to look at), I realized he could always look down at that scar and tell a story (although I’ve suggested he tell kids he got it fighting off a shark, or hang-gliding).. More importantly, he would always have a reminder that good things (in his case, having complete functioning of his arm) come through hard work and perseverance… and he has overcome insurmountable obstacles. Do I wish he’d never been injured? You betcha. Do I regret that scar? Not at all. It’s a part of what makes Jared who he is, and I adore that person more than words can say. Terrific, Karen. They’re a part of all of us. Luckily, mine are all cosmetic without the kind of trauma that your son had. That makes me think of Padma Lakshmi who has a long scar on her arm and is still a supermodel. I forgot. One of the originating thoughts I had around this was crowdsourcing stories for the ones on my arm. Riding into a tree while looking at a lake isn’t nearly as good as fighting a shark. Hmmm, I think I have been around all of those post 30’s scars when they happened! I got a big scar on the back of my right leg from an Achilles tear that I got playing tennis a mere month after turning 40. It reminds me that 1) tennis is the devil and 2) I’m not a spring chicken any longer! Yes. It’s Marty’s hat in the picture and his car I didn’t bleed on. You could indeed tell half of this story. It’s a wonder Suzanne let’s you ride with me with this track record! She proofread this and said she’d have some words to say. Probably about the stitches but I hope she’ll add some scar stories of her own. I really enjoy your blogs. This one made me think about scars that cannot be seen. Sometimes those are the most interesting stories…The thing to remember is that scar form as part of the healing process. Otherwise, they would still be wounds. Great points, Petra. I honestly didn’t want to go there in that post but thought about it all the way. It’s really appropriate and actually a much harder subject. It’s also different for everybody.